To open up the main floor space slowly, we are taking small (affordable) steps (key here: minimizing dust, Eleanor HATES dust) to open the kitchen and dining room up… This may have also been influenced by the imminent switcheroo of the washer and dryer in the basement, and the extremely narrow stairway the appliances would have to go up and down. Delivery date from Home Depot: Valentine’s Day (this was an intentional choice, ladies and gentlemen, and not a sexist commentary on the reestablishment of traditional gender roles within the home). Let’s take a look at the progress so far, shall we?! 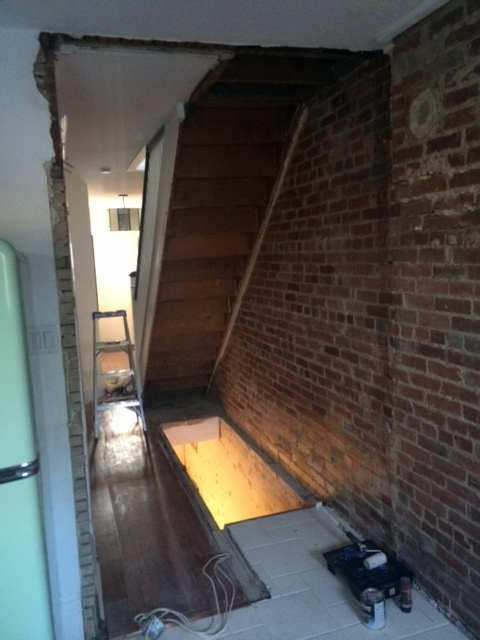 This is what the hallways from the dining room into the kitchen and then downstairs originally looked like. Both had doors on them when we first moved in. 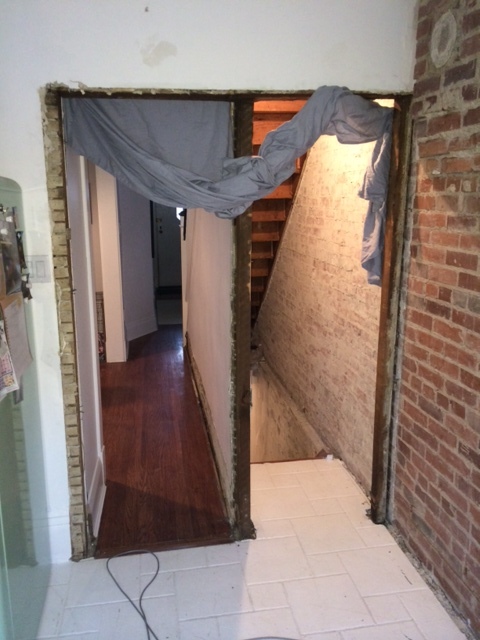 First, because you know, dust, the plaster was pulled off the existing brick wall that leads down stairs from the kitchen to the basement. 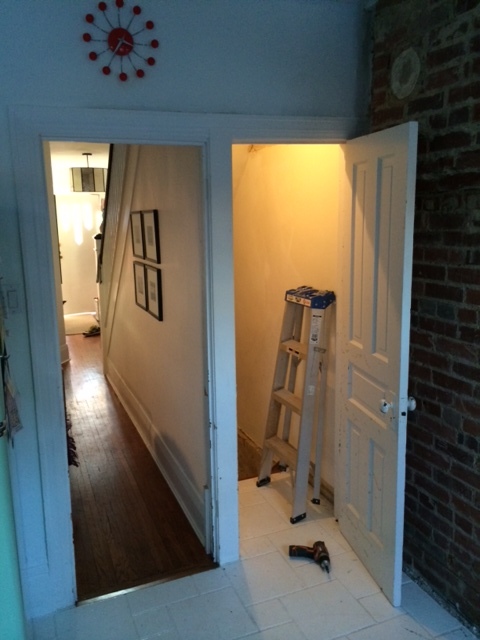 All the plaster was taken down from the brick wall… Next Stop: good bye divider wall! 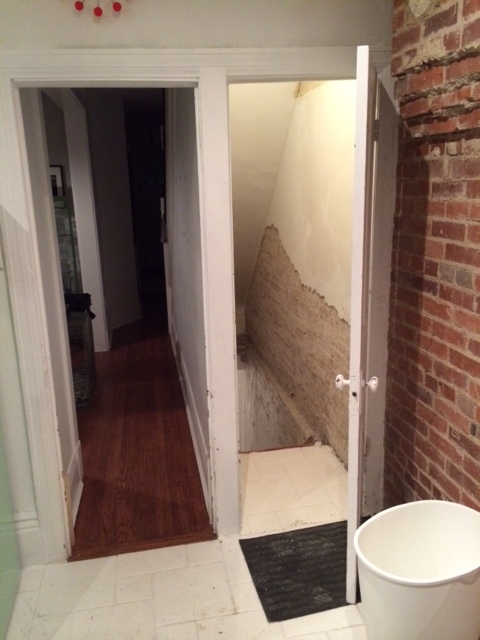 Our dog Buster was not a fan of the open space directly down to the basement and created a new running path from the dining room to the kitchen, that avoided the new open hole in the floor as much as possible. It’s also not really safe for people to have a space like that open either…. 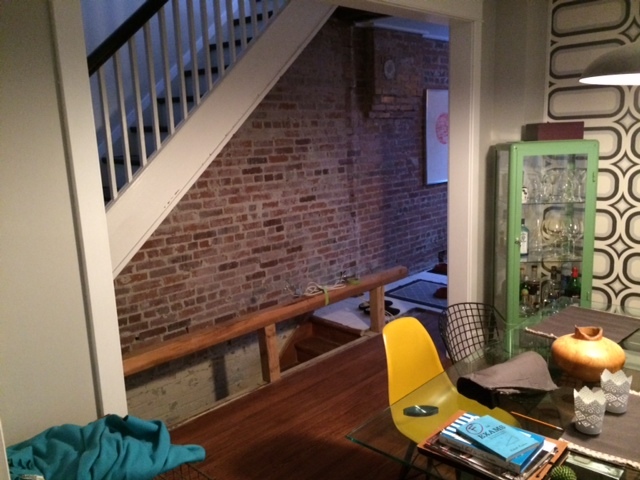 Hence temporary 2×4 railing.